Ape vs. alien robot tourist… GO! 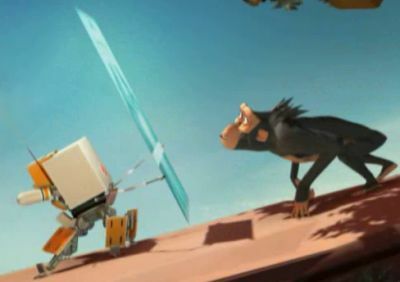 Lem, over at Robots-Dreams, blogged about this outstanding bit of animation a few days ago.Â You have to see this.Â Imagine a bunch of alien robot tourists landing in the African savanna and infuriating a curious ape.Â It’s just as awesome as it sounds.Â Strikingly well-animated, clever, and hilarious.Â Watching it will only take a few minutes out of your life, and it will leave you smiling and thinking about monkeys. We will pay for our hubris. We can always count on Stephen Colbert to let us know when we should be cowering in fear. According to last week’s ThreatDown, the robots are coming. They are coming, and they hate America. He cites a facial expression imitating robot that is disgusted by our president; the ever popular CB2 toddler robot, which will undoubtedly grow enormous and wreak havoc; and of course BEAR, the cuddly and heroic battlefield extraction robot, which Colbert fears is teaching us to trust bears a bit too much. Click the following link if you want to learn more about the threats posed to us by robots, bears, robots, bears, and robot-bears. A human imitating a robot imitating a human. How deliciously recursive.